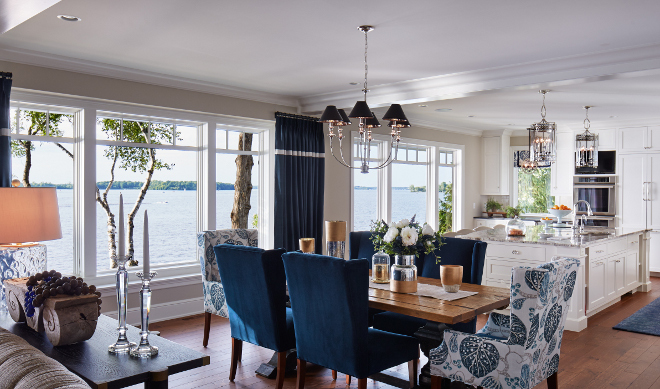 Built by Hendel Homes and with stunning interiors by Danielle Loven from Vivid Interior Design, this luxurious cottage is situated on a beautiful lake in Lake Minnetonka, Minnesota. 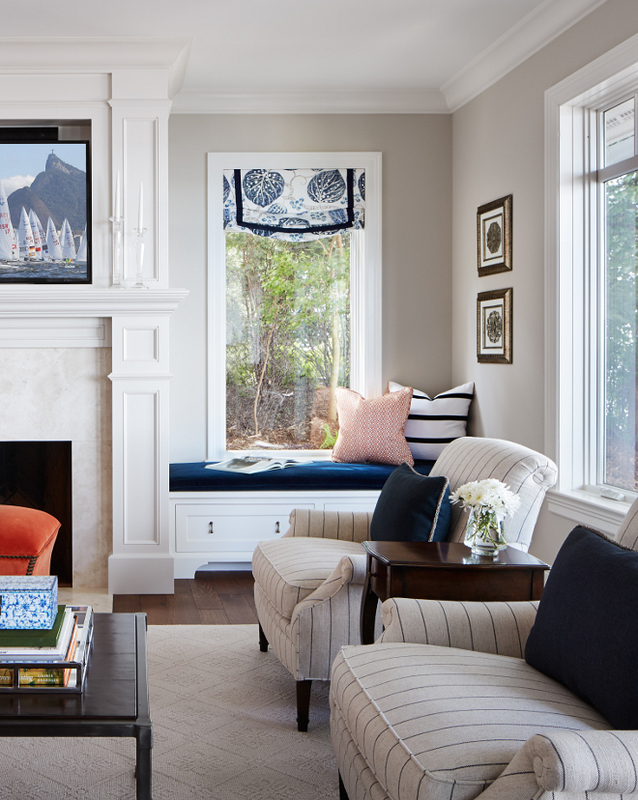 The homeowner wanted a refined cottage feel, with casual elegance and the designer managed to layer all of the details to create a welcoming setting inside and out. 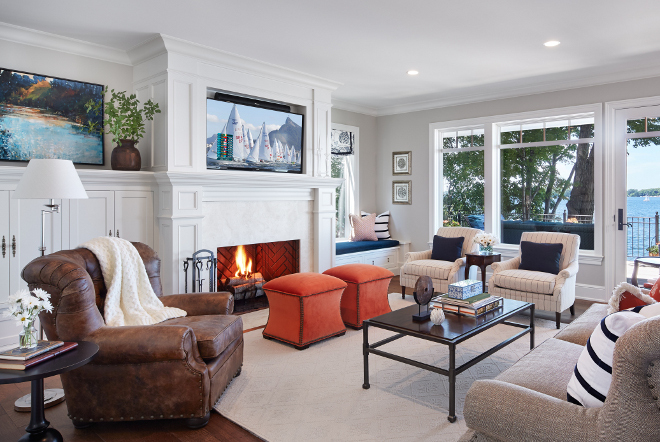 Take notes on paint colors, furniture, lighting, decor and more shared in this post. I love the architectural details of this home. It’s classic and timeless. Roof is cedar shake. Trim paint color Benjamin Moore OC-60 Icicle. Front porch features custom woven wicker furniture. 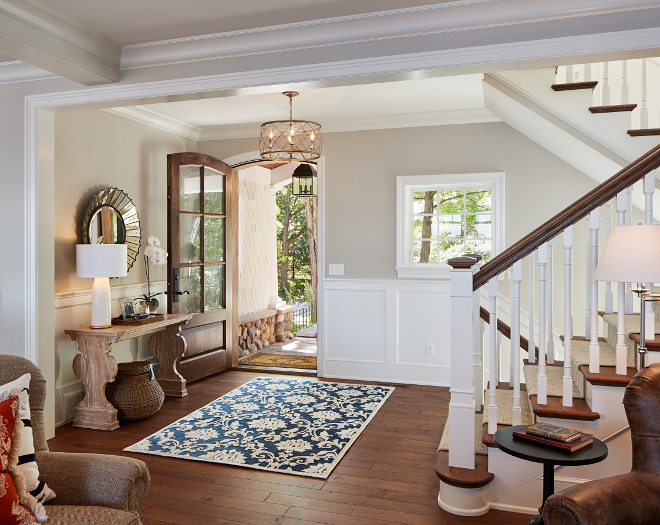 I simply love this foyer! It’s so welcoming and warm! The front door is custom, stained in Valspar Antique Mahogany. 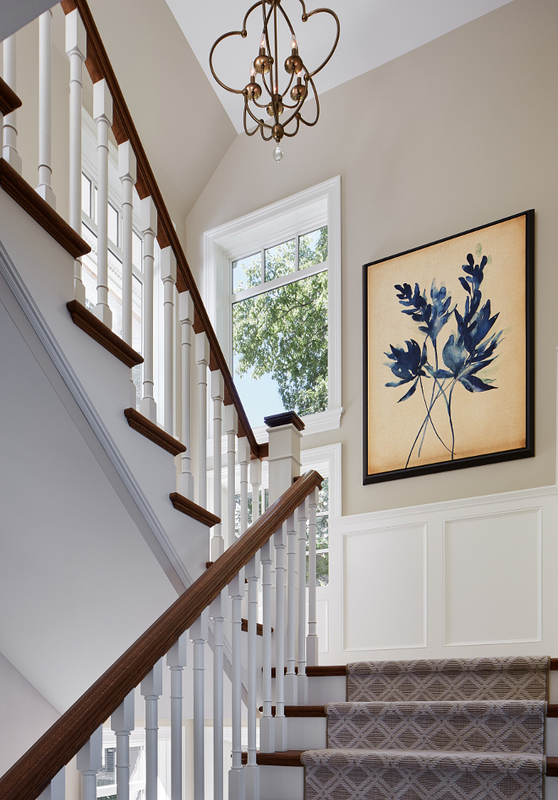 Wainscotting paint color is Benjamin Moore White Dove. 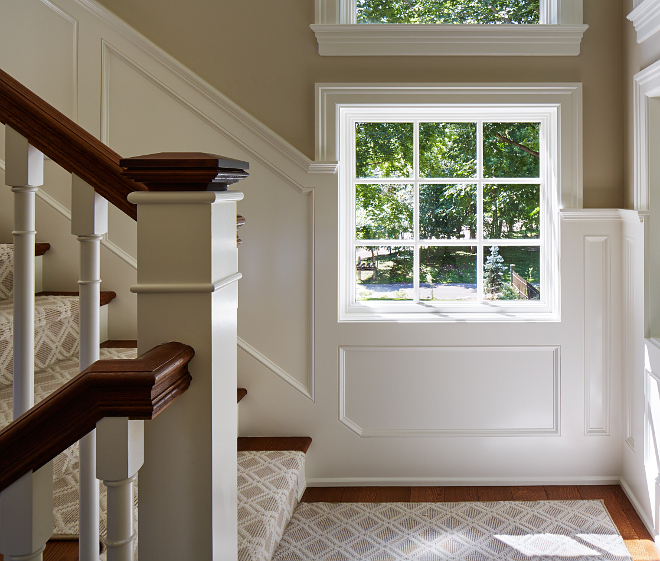 Wood is white Oak, riffed and quartered with custom stain. The great room is tailored but made to make you feel comfortable. 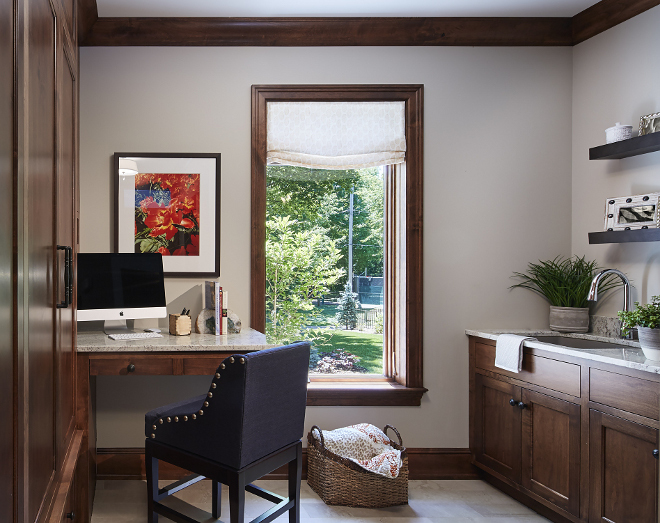 I love the furnishings and the practical built-ins. 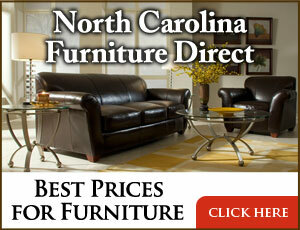 Furnishings & Decor: Vivid Interiors. Round Pedestal Table: Redford House. 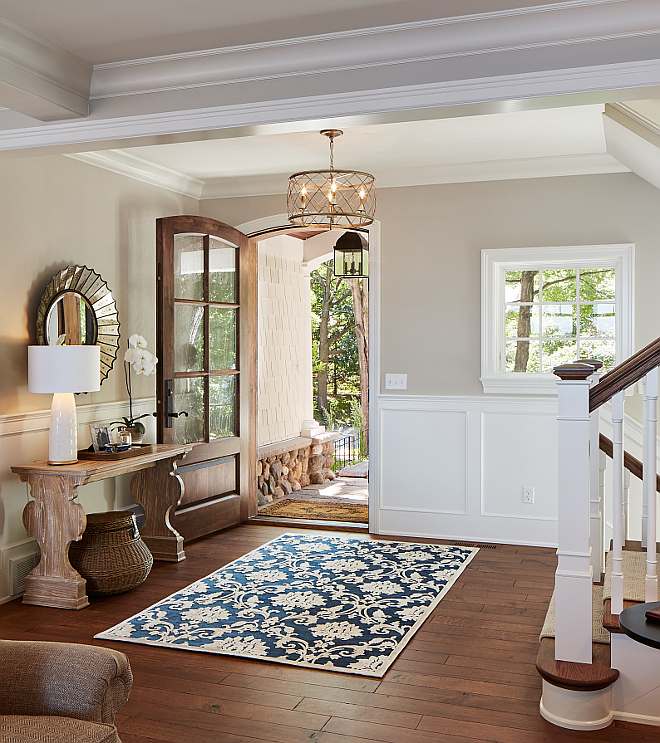 This gorgeous neutral paint color is Sherwin Williams Accessible Beige. 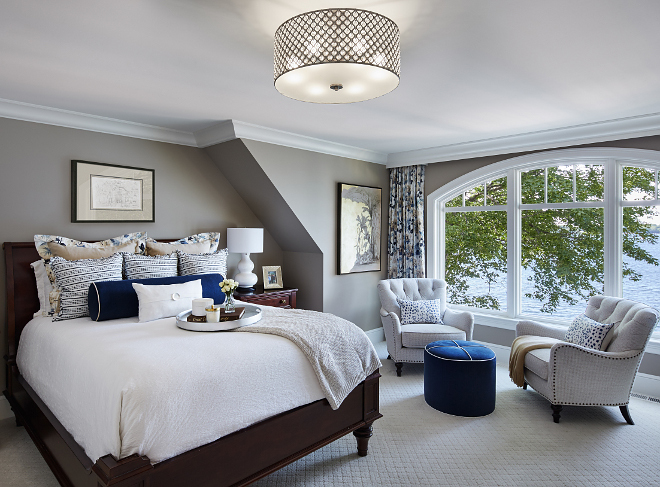 Ceiling Paint Color: 50% Benjamin Moore Linen White and 50% Ceiling White from Benjamin Moore. Tiered Side Tale: Hickory Chair. 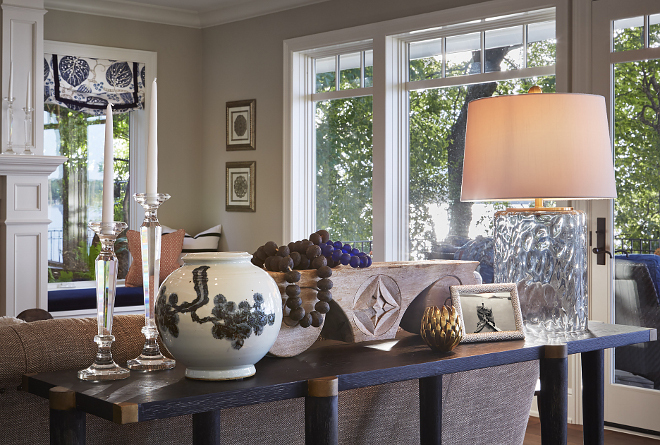 A console table by Currey & Co. features a glass table lamp, antique pottery, wooden pedestal and handmade sea glass beads. 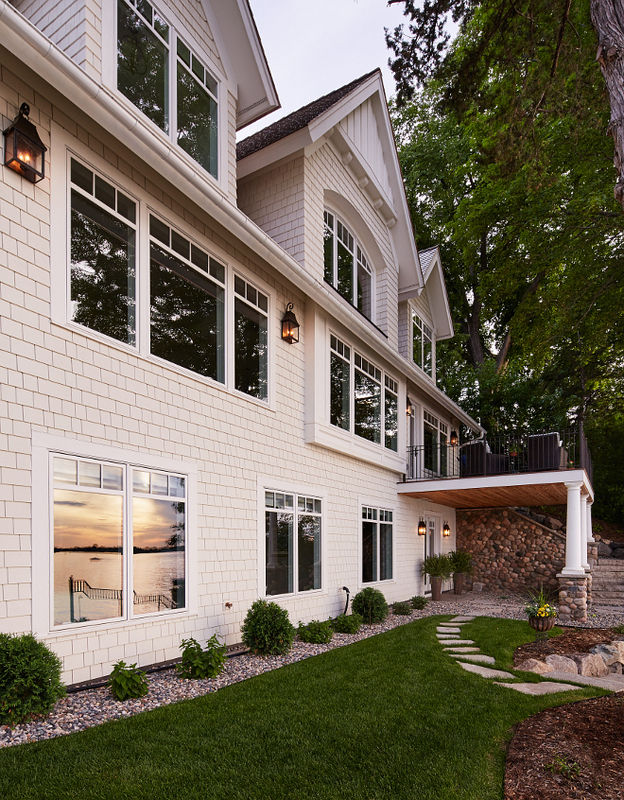 The openness of this home is perfect to capture the breathtaking lake view. The dining room chandelier is from Hudson Valley. The host chairs fabric is Designers Guild. 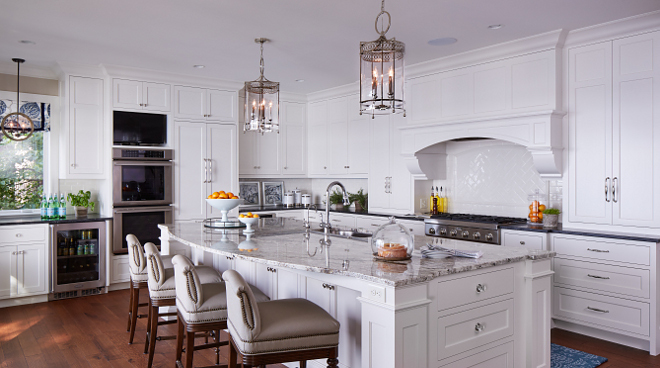 This white kitchen features a timeless design that will stand the test of time. 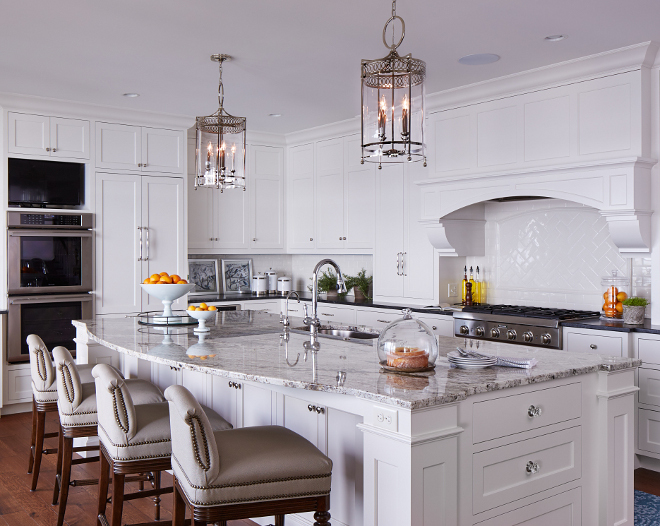 The backsplash is custom hand-made crackle tiles from Sonoma Tile Makers. This is a 10’ long island with custom crystal hardware flaking each end. Kitchen Cabinet Details: Maple painted cabinets. Inset doors, polish nickel hardware. Soft close drawers. Lighting is by Hudson Valley. 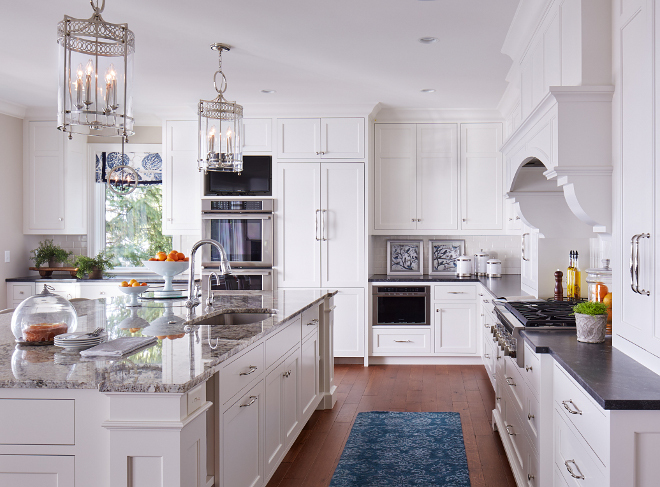 Kitchen Cabinet Paint Color: Benjamin Moore OC-17 White Dove. Perimeter Countertop: Jet Mist Granite honed. 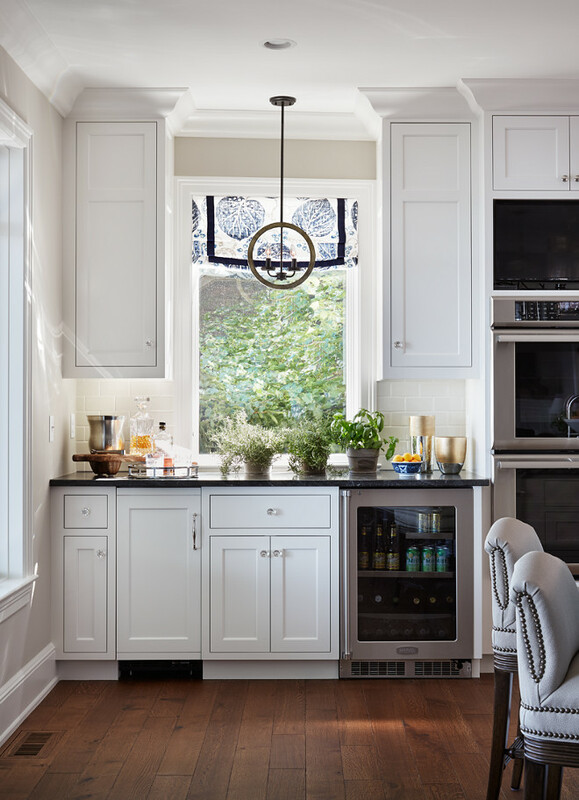 The kitchen bar is perfect to prepare the daily beverages or to be used as a butler’s pantry when entertaining. Bar Countertop: Jet Mist Granite – honed. Window Treatment: Designers Guild Fabric. 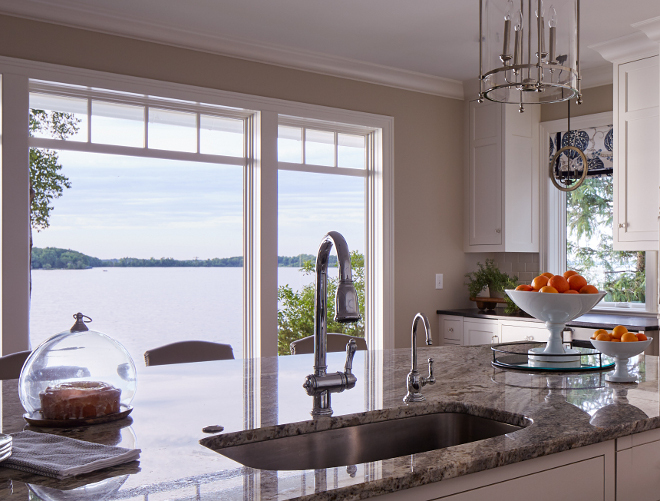 The kitchen island features a white and gray granite countertop; Serenity Granite. Kitchen faucet is Victorian Pull-Down Kitchen Faucet by DXV. 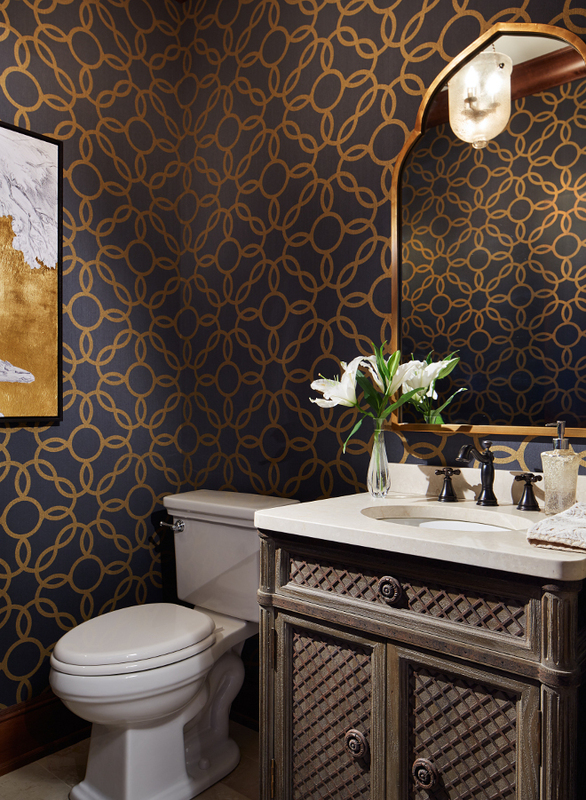 The powder room features a gorgeous navy and metallic gold wallpaper by Phillip Jeffries. Toilet & seat are by Mirabelle. The mudroom wood cabinets are Alder. Cabinet stain is Valspar Antique Mahogany. Stairwell paint color is Sherwin Williams SW 7036 Accessible Beige. Wainscotting paint color is Benjamin Moore White Dove. Stair runner is Stanton High Gate, Leighton, Canvas 48187. 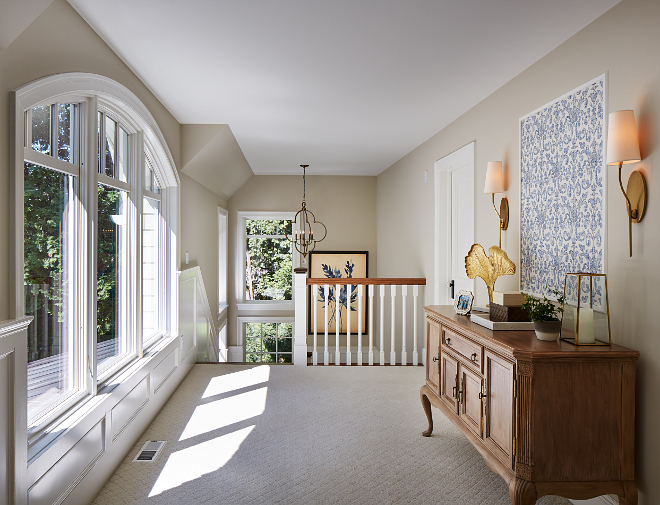 The upper hall features a framed wallpaper by Thibault above an antique sideboard. Upper Hall Sconces: Hudson Valley. Imagining waking up with a view like that every day. The ottoman, bedding and window treatments are all custom. Lamps are Barbara Cosgrove and the chairs are Lexington. Bedroom paint color is Benjamin Moore CPS 190 Rocky Beach. 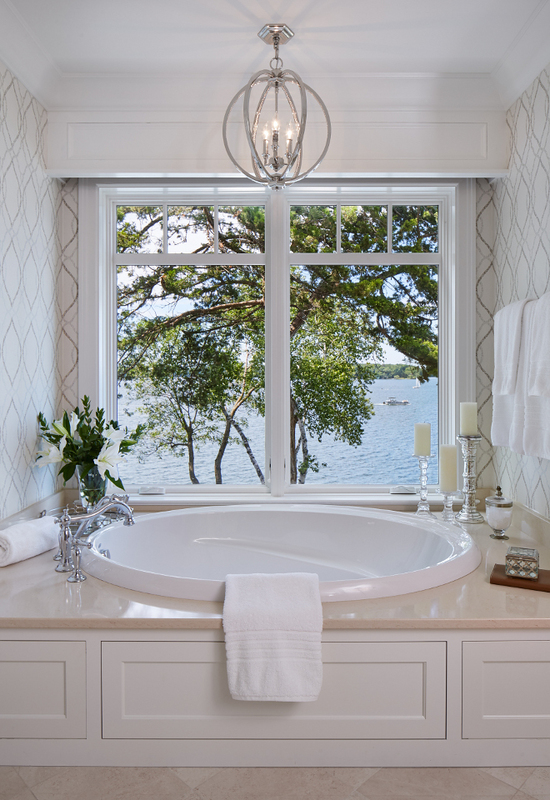 The master bathroom is serene and feature close-in lake views. Wall paint color is Benjamin Moore HC-84 Elmira White. Wallpaper is by Harlequin. Faucet is by Mirabelle and sink is a Kohler. Perfect place to relax at! Tub filler and drop-in tub are AmStan. 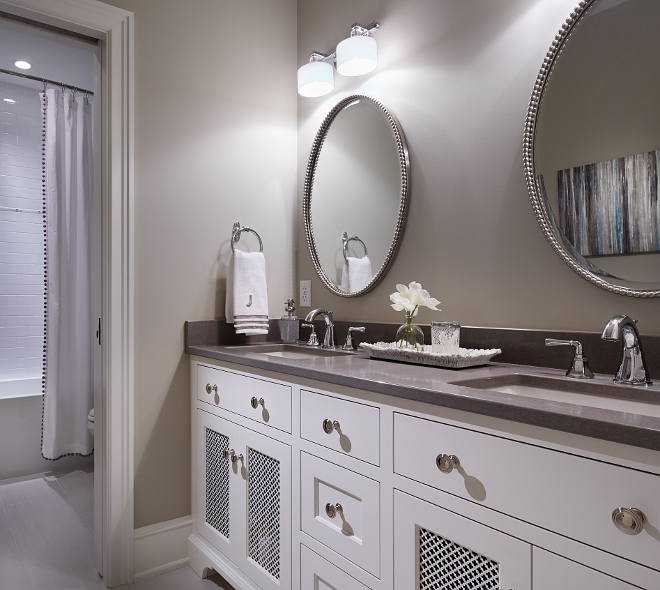 Master Bath Tub Light: Murray Feiss. 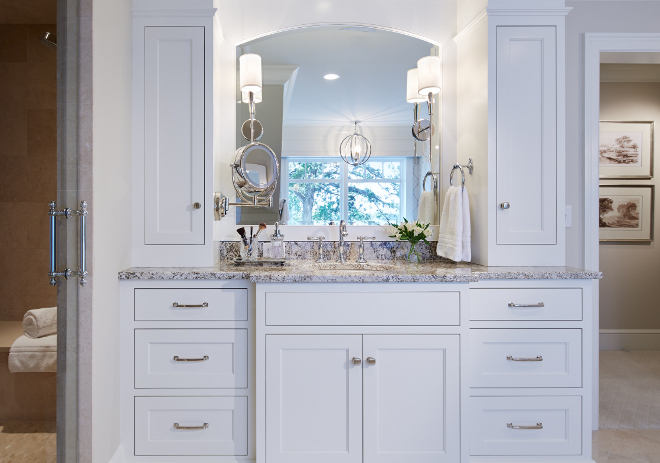 Cabinet paint color is Benjamin Moore OC-17 White Dove. 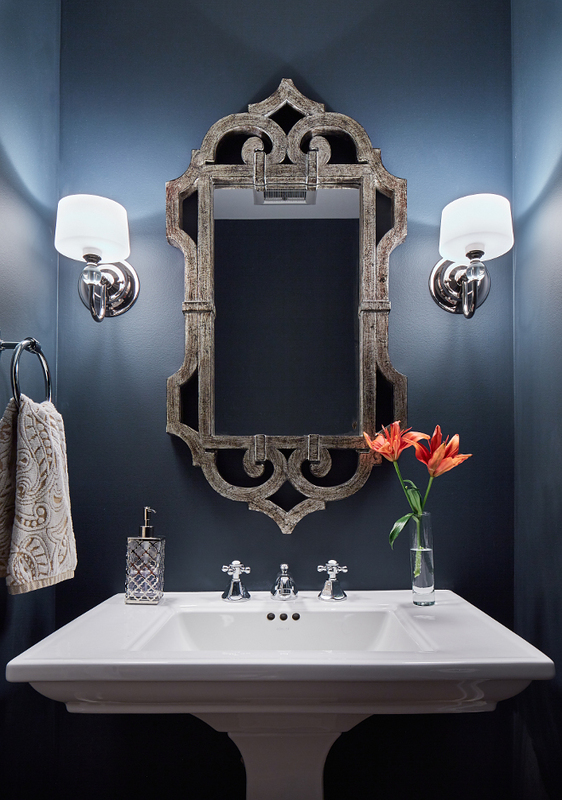 Sconces are from Hudson Valley Lighting. The lower level continues to feature the same design aesthetics. The lounge chair and the media console is by Lexington. Paint color is Benjamin Moore HC-172 Revere Pewter. Wall paint color is Benjamin Moore HC-172 Revere Pewter. Cabinet is BM White Dove. Paint color is Benjamin Moore CPS 200 Quicksand. Paint color is Benjamin Moore Hale Navy HC 154. Pedestal sink is by Kohler. The exterior feature custom stained shakes. Isn’t this lakehouse dreamy? The exterior lighting is by Capital Lighting. A huge thank you goes to Greg Clark and Amy Hendel for sharing all of the sources with us! Interior Design: Vivid Interior Design – Danielle Loven. Vivid Interior Design on Instagram. Hello, everyone! I am little late with the post today because the kids weren’t feeling very well last night and I couldn’t do my work on the usual time. Busy-busy!!! Did you guys hear Brad Pitt and Angelina Jolie are getting divorced? I am not someone who follows celebrity life. 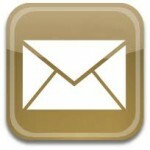 In fact, I am one of the most private person you could meet and I don’t have much interest on other people’s lives. It’s just not my thing… but hearing this made me so sad and I had to mention this with you. I honestly feel for their kids. I am sure Brad and Angie will move on, but divorce is really hard on the kids. Money, fame, these kind of things do not resolve any problems… sometimes it even aggravates them. I just hope they can prioritize the love for their children during this hard time. It was really great having you here today! We’ll talk again tomorrow! Sources: Interior Design: Vivid Interior Design – Danielle Loven. 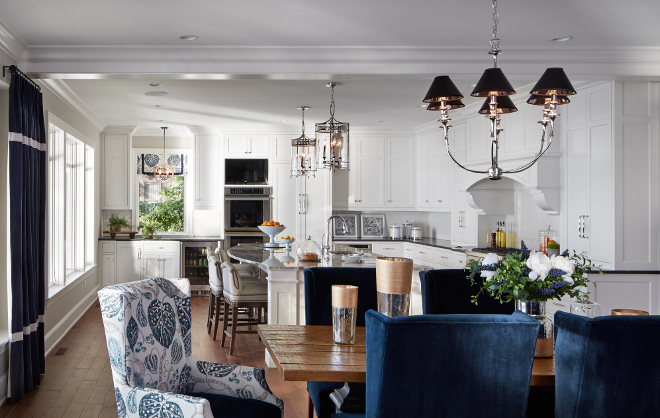 Builder: Hendel Homes. Architecture: Ron Brenner Architects. Photos: Corey Gaffer Photography. It’s always great hearing from you, my friend. 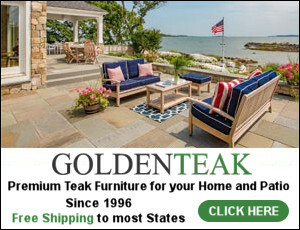 Where is the living room beige rug from? Could you give me the source for that? Also, where can I find the carpet that is shown throughout the home?